Shiraz Pinot Noir by Botobolar of Mudgee. Sweet berry fruit dominates, the tannins are light on their feet, dancing around the palate and skimming over the tongue with refreshing mint and rosey characters. Preservative free Dry Red, Shiraz and Pinot Noir sourced from Botobolar's Organic Vineyard at Mudgee. Growing grape vines organically in balance with the environment, not demanding too much from them or the soil, hand picking and pruning, and creating handmade wines all combine to deliver to you, good value premium organic wines. A big fruit driven wine with soft tannins and great mouth feel, the Botobolar is built to enjoy with any cuisine. 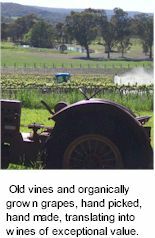 Botobolar's 22-hectare vineyard established in 1971 is Australia's oldest organic vineyard, the vines have always been grown organically without the use of pesticides, herbicides or chemical fertilizers. Growing grape vines organically in balance with the environment, not demanding too much from them or the soil, hand picking and pruning, and creating handmade wines all combine to deliver to you, good value premium organic wines. Botobolar wines are made in accordance with organic growing and winemaking principles and certified by: ACO (Australian Certified Organic) Cert. #P228 PO Box 3404 Toowoomba QLD 4350. 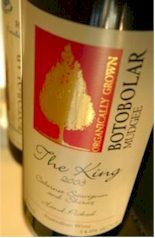 Botobolar's organic dryland vineyard is famous for its rich and spicy Shiraz, chocolate and mint Cabernet Sauvignon, Busby clone Chardonnay, and Marsanne varieties. This bit of earth delivers some of the best grapes in the district. Old vines and organically grown grapes, hand picked, hand made, translating into wines of exceptional value. Preservative Free Dry Red Wine is available! A truly delicious wine full of flavour, a great choice for the health conscious wine consumer! Botobolar's commitment to minimum input during the winemaking process is exemplified by great wines. All are made in a low-preservative style, they contain approx 40-60% less sulphur dioxide, added as an anti-oxidant, than most commercial white wines. These wines are recommended for everyday drinking for those who suffer mildly from allergies. All are suitable for medium term cellaring. The Cellar Door at Botobolar Vineyard is not just for wine. As the wine industry in Mudgee continues to grow, the town has developed new eateries, shops and accommodations. Keeping up with this trend of diversification, the Botobolar cellar door offers some interesting extras worth seeing. Regional produce, honeys, tapenades and olive based products are featured, and there are always new surprises.